The tournament is in two parts - a morning, individual competition and an afternoon, team competition. The morning competition is a 90 minute multiple choice calculus exam. Once the morning exam has begun, students may not leave the room until they are finished with their exam. 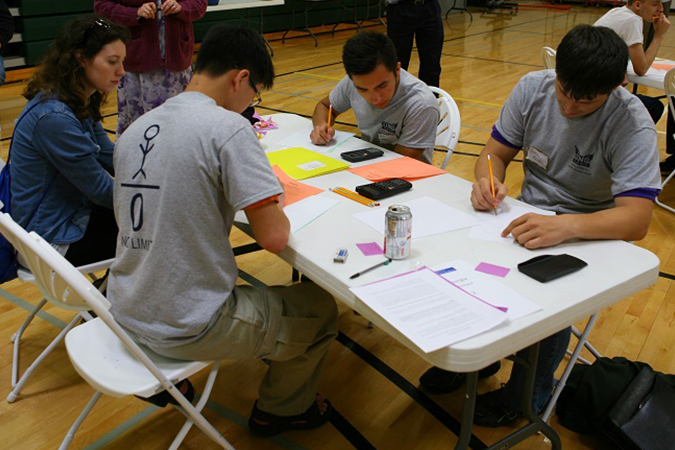 The afternoon competition has approximately ten rounds where teams have up to ten minutes to solve one or more problems. Rounds will not be delayed for missing team members. Afternoon problems include questions from algebra, trigonometry, statistics, and logic. Calculators may not be used during the morning session. One TI-85 per team will be provided for the afternoon session. A brief intermission will be held approximately halfway into the afternoon competition. Sponsors may confer with their students during this time. The awards ceremony immediately follows the afternoon competition. Write your name and the name of your school on the scantron. No additional information is necessary. During the exam, should you need additional scratch paper, a new scantron or another pencil, raise your hand and someone will bring what you need. Do not leave your seat until you have finished the test. You are permitted to write on the test booklet. Should you have a question concerning one of the problems, arbitrators are available after the test. Only legibility questions may be answered during the test. When you finish the test, turn in the scantron only. Make sure your name is on the scantron. You may keep the test booklet. You will be given a key to the test outside of the auditorium. Leave any scratch paper and pencils on the desks. They will all be picked up later. Note: Please be quiet in the hallways after you finish the test and leave the room. Other students are still taking the test. What makes up an afternoon team? A team competing for an award consists of a maximum of four eligible students from the same college. A college can elect to have a team with fewer than four members. The number of teams a college may have is determined by the following formula. # of teams = Greatest Integer [(n -1)/4 + 1] where n is the number of students from a college. Mixed teams comprised of a maximum of four eligible students from different colleges may participate, but their scores will not count in the overall scores for the colleges. A table is assigned to each team, each team having a set of folders - a different color for each team. On the table is the answer sheet folder containing blue colored sheets - a sheet for each round with the team name, round number and a time box on it. Find your sheet for Round 1. Each team also has a question folder with their team name and color. Before the first round, two copies of the round 1 question are put into each question folder. When the round is ready to begin, these folders will be given to each team at a table. The folder must not be touched until the round has officially begun. Any team opening their folder before the round has begun will be disqualified from the round. When the round officially begins with the buzzer, the team will open the folder and begin working. When your team has worked to a solution, put your final answer on the round 1 answer sheet. As soon as you have your answer sheet ready, a team member needs to raise his/her hand so that the proctor (Know who your proctor is!) can come to your table and record the exact number of minutes remaining on the timer. Note: this means that the times of "7:05" and "7:45" would both be recorded as a score of 7 for a correct solution. The proctor will write the time in the box in the top right corner of the sheet. The proctor will take the answer sheet to the front table to be delivered to the graders. After picking up the team solution to this round, the proctor will also pick up the questions folder and return it to the front table. This way we will know which teams have finished and which teams are still working. The folders will now be prepared for Round 2. When every team has finished or time has run out, the correct solution to the round will be displayed on the overhead projector. The question folder for the next round will then be distributed to the tables. The question folder should not be placed back on the table until the next round is ready to begin. We will continue this process for 9 more rounds. We will have an intermission after Round 5. Between some of the rounds, the team standings will be posted on the overhead projector. If you need additional scratch paper, ask your proctor to provide you with some. Let your proctor know if you are having problems with your calculators. Please leave the folders on the table at the end of the competition. Your sponsor will receive a packet with all the afternoon questions. We will have door prizes while the winners are being determined. Individual scores are determined by the number of correct answers an individual gets in the morning competition. Students are not penalized for incorrect answers. Team scores are composed of the scores of the team rounds. The morning individual scores are not included in the afternoon total team scores. At the beginning of each round the time clock is set at 11 minutes. The number of whole minutes remaining when the solution is submitted is the score given for a correct answer. A team may submit an answer only once. No partial credit is given. The overall scores for the colleges are determined in the following manner. The morning session and the afternoon session will be weighted equally. The top three individual morning scores from each college will be averaged. This averaged score is out 40 so the percentage correct out of 40 will be used instead and this will count as 50% of the overall score. The highest score of a team from each college in the afternoon competition will also count as 50% of the overall score. In the afternoon session the score is the same as the percentage of points received out of the total possible. The maximum possible score in the afternoon is 100. In the event that a college only has one student participating, then their score alone will determine the morning portion, and in the event a college only has two students participating, the average of their scores will determine the morning portion. One of the 40 questions in the morning test will be (clearly) designated as a tie breaker. This question could be counted twice. First as one of the 40 questions then, in case of a tie it will be counted again. For example if two students, A and B answer 30 out of the 40 questions correctly and are tied for one of the top places, then the problem designated as the tie breaker will be looked at. If student A answered it correctly and student B did not, then student A is the winner of that tie. If both answered correctly or incorrectly then the tie will be broken in the following manner. If there is a tie from the morning or afternoon competition, a tie breaker question will be administered by the test administrator after the afternoon competition is over. The first individual or team to submit a correct answer within five minutes will win the tie breaker. If needed, this will be repeated until the tie is broken. Only one response per individual or team will be accepted. The college with the highest morning average will win the tie. The college that wins the afternoon session tie breaker wins the tie. The two teams involved in the afternoon tie (below third place) have a tie breaker question as described above and the college that wins the afternoon tie breaker wins the tie. The college that has the highest individual scorer in the morning wins the tie. What if there is a protest? If there is a protest concerning the morning competition, it must be presented to the arbitrators before the afternoon competition begins. Arbitrators will be identified to the sponsors at the sponsor's meeting which takes place during the morning competition. If there is a protest concerning the afternoon competition, it must be presented to the arbitrators before the awards ceremony begins. If there is a protest concerning the tie breaker competition, it must be presented to the arbitrators before the awards ceremony begins.